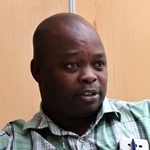 Professor Blessings Chinsinga is an ESID researcher in Malawi focusing on the country’s political settlement and its implications for inclusive growth and development. He fulfils two roles at the University of Malawi: since 1996 he has been Associate Professor at the Department of Political and Administrative Studies, where he teaches undergraduate and postgraduate students, focusing mainly on political economy of development, development theory, public policy analysis, and institutions and development; in 2013 he took on the additional role of Deputy Director for the Centre for Social Research (CSR), a research arm of the Faculty of Social Science, Chancellor College, University of Malawi, where he is primarily responsible for driving CSR’s research, consultancy and training agenda. After reading for his BA in Public Administration at Chancellor College, University of Malawi, Blessings read for an MPhil in Development Studies at the University of Cambridge, UK. He received his PhD from the University of Mainz, Germany, in 2005. Blessings believes passionately that it would make a huge difference if girls could be equipped with leadership skills at an early stage, and volunteers as a leadership teacher at Darlo Girls’ Foundation school. In his leisure time, he enjoys being with his family. They like to eat out, sampling international cuisines, and watch football – Blessings is an ardent Arsenal fan, while his wife and son are Chelsea diehards. The ESID work is unique in many ways. What I find particularly engaging is the innovative way of asking the very familiar old questions, that have been at the centre of development debates, in different and simple ways – which push both established and upcoming researchers to creatively blend abstract theoretical conceptions with practical realities that are context-dependent, yet offer illuminating insights on key development issues in a wider context. This is further buttressed by cross-country comparisons, not only between and among countries from the same continent, but also even across continents. The innovativeness of the ESID intellectual platform is leading to the generation of knowledge with direct relevance to pressing contemporary development questions – at a time when there seems to be somewhat of a gridlock in development thinking, policy and practice. I have been particularly inspired by the creative use of the highly contested notion of political settlement, both in a historical and contemporary perspective, to shed light on the various dynamics of development experiences across different countries and contexts. This is not to gloss over the continuing debates about the notion of political settlement. Rather, this is an acknowledgement that ESID work has, through extensive engagement among scholars from different disciplinary backgrounds and research traditions, provided illuminating insights on how to meaningfully utilise this notion, which many still project as being highly nebulous. In the Malawi context, my desire is to explore whether, using the insights generated so far, we can go beyond characterising and drawing implications of political settlements during different periods, to engage with relevant stakeholders on how we can begin to identify – at least in a systematic manner – fundamental strategic pillars for a dynamic, progressive and inclusive political settlement. It is a big task, but it is something that the innovative ESID work can probably measure up to. What are some key challenges for inclusive development in Malawi? There are so many challenges regarding inclusive development in Malawi. The aspirations for inclusive development exist across all socio-economic categories, and this is precisely the reason why, in unison, Malawians fought for political change in the early 1990s. However, instead of the gap between the haves and have-nots narrowing down, it is widening at an alarming rate. This has to do with the failure to think through key elements of a society that we wanted in place of the authoritarian one-party dictatorship. There is a lack of shared national values about the key fundamental strategic pillars of national development that would effectively spur inclusive development processes. The huge disparities in living standards between a small minority and a large majority of the population stand in the way of genuine inclusive development. And this is not helped by the rapidly dwindling economy, heavily reliant on aid, in the context of continuing donor fatigue and in the wake of the mounting fierce international anti-smoking lobby (tobacco is an important export crop for Malawi). I strongly believe the issue of leadership should be included. All the goals that one can think of to effectively contribute to the attainment of sustainable development can only be achieved in the context of progressive and visionary leadership. In this regard, leadership should be broadly understood beyond political leadership. We require sound and effective leadership in the private sector, government and civil society, at all levels of the hierarchy, to make things work towards the achievement of inclusive development. The key to making ESID work relevant to practitioners is the creation of platforms for continuous engagement and dialogue with them. The dialogue should build on an initial engagement between ESID researchers and practitioners, to generate a common understanding of the challenges faced by the countries involved and a concrete indication of the potential value addition of ESID work. Practitioners are looking for immediate solutions, but some of the solutions that they are looking for require systematic investigation over a long period of time. This is why opportunities for continuous engagement and dialogue are really critical. The traditional modalities, such as dissemination workshops, policy briefs, working papers and various forms of scholarly publications, should be complementary to, and further contextualise the continuous dialogue and engagement processes. For further information, visit Blessings Chinsinga’s researcher profile.